Alan Curtis (AC) was one of the most radical pioneers of Handel opera performance in the 1970s, and his groundbreaking 1978 recording of Admeto is still the only available recording of that magnificent opera. 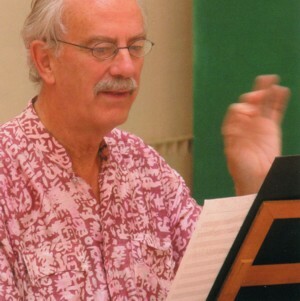 Then for many years Alan Curtis virtually disappeared from the recording business, but in recent years he has returned to Handel opera with an increased appetite with recordings of Rodrigo in 1999, prize-winning recordings of Arminio in 2001 and Deidamia in 2003, as well as several recital discs. He spoke to David Vickers (DV) at the 2004 Göttingen Handel Festival, where his Italian group Il Complesso Barocco performed excerpts from Lotario prior to a complete recording that will be released circa August 2004 by Deutsche Harmonia Mundi. DV: What is your first memory of Handel’s music on a personal level? AC: You mean when I first discovered Handel? Well, like everyone else I sang in the chorus of Messiah, and it was directed by a little tiny Welshman called Gomer Llewellyn Jones. He wasn’t a singer, unlike practically every other Welshman, but of course he loved singing and he conveyed that to us. Unfortunately, I have never been able to sing well, but thanks to him for a moment I almost thought that I would. Immediately after that experience I tried taking some singing lessons. Fortunately, I went instead into the business of working with and gradually conducting singers, so here I am. But that started my love for Handel, and very early on I thought “why, when there is this huge number of volumes on the shelf of great Handel works, are they never even looked at? Why do people only do the oratorios - usually the same ones over and over?” Then I suppose my next discovery was Acis & Galatea and Semele, which in those days were still rarities. Then I began to wonder what else there was, and began to work with some really good singers. DV: So did your perception of Handel change when you were studying music as an undergraduate? DV: Did you discover more about Handel opera while you were teaching at the University of California at Berkeley? AC: Yes - then I heard of somebody named Winton Dean, and we invited him to Berkeley. His first book Handel and the Opera Seria was really just a series of lectures that he’d given at Berkeley. Those lectures featured live musical illustrations organised by me and some of the singers that I worked with at that time. I remember we did things like Agrippina’s aria “Pensieri” with oboe. The oboe soloist was Bruce Haynes, who is now famous because he has written the book on Baroque Oboe. Those were pioneering days, and this was probably the first time any one had played that piece with a baroque oboe in modern times. DV: How did you begin to start recording during the 1970s? AC: That started also at Berkeley, with a programme that I did of Monteverdi and Frescobaldi. Then right away that recording was successful so the recording company asked me why don’t you do L’Incoronazione di Poppea with this wonderful singer Carole Bogard. So I plunged into that with no shame, and that launched me in the operatic world. Eventually I performed Poppea in Amsterdam with Leonhardt, and then in Brussels without him, and in Spoleto, where it was a sensation. That led to invitations from all the major Opera houses in Italy, including an invitation at some point from La Scala to do whatever Handel opera I wanted to with Carolyn Watkinson. That was a difficult choice but I quickly decided on Ariodante - and I think it is still what I would pick today if somebody said I could do anything I want. I just think, everything considered, it’s the best Handel opera! DV: Were you still teaching at Berkeley during this time? AC: Yes, but the only thing I did relevant to Handel was a course for non-majors about Bach and Handel, which was something that had been on the books since Bukofzer, the author of one of the definitive textbooks on baroque music who had taught at Berkeley, but who died just before I arrived. I took that over, and made it a very popular course, especially with non-music majors, many of whom were intellectuals. So I got lots of physicists, and now they are prize-winning physicists, or famous in their field, but they come up to me and say “You taught me to love Handel’s music, and I still do!”. DV: Admeto was the first Handel opera recording you made in the late 1970s. How do you feel about its reissue by Virgin? AC: My first reaction was anger because I would have preferred to do it over again. I didn’t even listen to it again until it had already been reissued. Of course I have the old LPs, but I never play LPs any more. I keep thinking I will, but never get around to it. I don’t even get around to hearing all the CDs. I finally did hear some of Admeto on CD. I must say I haven’t heard it all, but I heard enough to persuade me it isn’t as bad as I thought it might be. AC: Some of it sounds like it is still this side of the divide, and it doesn’t sound like an ancient thing where even using original instruments it sounds the same as on modern instruments. There are two things that don’t please me: the first is that the oboes are still very rough. I think in those days baroque oboes just didn’t have the refinement that they do now. Nobody did. I probably had the best available in those days, including Bruce Haynes, Paul Hailperlin, and Ku Ebbinge. They’ve all made great progress. Bruce has gone more towards the scholarly side, but everybody has made enormous strides in the refinement of the baroque oboe sound. The second problem is the singing. I find the recitatives too slow. James Bowman has a wonderful voice of course, but his Italian was absolutely wretched in those days. Also, René Jacobs was sliding all over the place - something that he wouldn’t do again now, but certainly did in those days. DV: Admeto must have been one of the earliest pioneering recordings of Handel opera on Period instruments. AC: I think Admeto was the first because it was just before Kuijken’s Partenope - another pioneering example. DV: Some of those late 1970’s Handel opera recordings have a very pleasing atmosphere despite the evident technical flaws. AC: Yes. If you carefully chose one or two pieces, you could imagine they were recorded fairly recently. Which is a tribute to those recordings because so many areas have certainly improved since. Which is not to say that everything is better now! But certainly the technical level is generally much better than it was then. DV: I’m sure you performed other operas in the meantime, but the next Handel recording you made was an abridged single disc version of Floridante in 1991 with Tafelmusik. Why was this never recorded complete? And why had you not made any recordings for so many years? AC: Unfortunately we didn’t have contact with a major label. I didn’t have time to pursue it, so I just accepted what was offered: the Canadian Broadcasting Company agreed to put out a version, but they required that it only feature Canadian singers. Fortunately we had Nancy Argenta, who can be classed as a Canadian even though she has hardly spent any time there in the last 20 years. We also had Catherine Robbin, so it was not a bad cast. But we had to exclude a couple of non-Canadians who had been in the cast when we had done complete live performances, and CBC refused to record the complete opera because it had to be only one CD. That was a great pity but that somewhat stimulated my idea of doing recordings. I was then in a period when I really didn’t like recording. I wanted everything to be live performance, but now I’m in a period when it’s nice to culminate our work in a live performance, but I want to have a recording made. So now my projects tend to be aimed at recording. Which I suppose you could say is the result of old age, but my viewpoint has changed: I want to leave a record but don’t want to do long exhausting tours. I would much rather do a brief exhausting recording, then sit back in my armchair and listen to it! DV: The first of your current series of Handel operas on Virgin Veritas was Rodrigo. AC: I had proposed Rodrigo to Florence years ago, and the director of the Orchestra Regionale Toscana at that time wanted to do it, but it didn’t work out. Then it had to be postponed, and suddenly he was no longer artistic director. This is the way things often happen in Italy: suddenly you’re just let go. Suddenly, as always happens in Italy, there was a case of musical chairs, and he ended up being artistic director at Sienna. So then he approached me, and said “let’s finally do Rodrigo”. But my performing it in Sienna probably made the chances of doing it in Florence even less. It has been about 500 years since Florence and Sienna had a war, but the war goes on between them. Even today, if you do something in Sienna the Florentines say “Oh…” disparagingly, and vice versa. But I haven’t given up hope of bringing Rodrigo back to Florence. Handel wrote this opera for Florence for God’s sake, and there are some of the most magnificent arias in this piece, including the F minor aria that Sandrine Piau sings gloriously, that were cut at the time and so await not only a revival, but their first performance in the city for which they were composed! I even doubt that anybody in Florence bought my recording because Italians never buy records: the statistics prove that. I think we’ve sold something like maybe 800 copies in Chile, and 500 in Kuwait, and 3 in Italy! Mostly to the singers who were on the recording! Anyway, Rodrigo should someday be done in the city for which it was composed. It is scandalous that it has still not been performed there. It is a piece that I love, and I directed the first performance since Handel performed it for the Medici. It never got revived in the 18th century, was left untouched in the 19th century, and considered lost in the 20th century. Suddenly all these pieces turned up, and through Winton Dean and Anthony Hicks I found out about them, and put everything together. DV: Did you have to ‘reconstruct’ any music for Rodrigo? AC: I composed what was missing, and I’m very proud of the opening accompanied recitative that I wrote. It was a viable piece which we did on stage for the Innsbruck Festival in 1984. Then we did it for a concert in Sienna, and I thought “Why not record it?” My novelist friend Donna Leon was there, and said “Oh, this is marvellous – you must do more of these”. So someone came along and asked me to perform any Handel opera I chose, but this time it had to be a choice between less known operas. So I hit on Arminio – although it was at this time I started thinking about Lotario. I was also then going to do Siroe, which I ended up handing over to Andrea Marcon instead. DV: You prepare your own performance material. How do you make decisions about text with a Handel opera? AC: I’d like to acknowledge that often one of the first steps is an e-mail to John Roberts at Berkeley. Even though he’s very busy, he’s good about giving me the current state of research. He knows what practically everyone’s doing: even some people who aren’t considered Handel scholars! He can tell me “well this person did a good paper at a meeting about 10 years ago, and he probably hasn’t done anything on Handel since, but it was a good paper and he knows about this opera, so you should be in touch with him.” Or John Roberts might tell me about a new source that has just turned up. So I start right away with getting the news from John. Then I contact other people - as you know, I’ve been in contact with you – and then I get busy myself at Berkeley. DV: But don’t you live in Italy now? AC: Yes, but I go back to Berkeley at least once a year, and stay in part of my old house which I kept, although I sold the rest. I make trips to visit my daughters, and when they’re busy I go off to the library. For instance, Bärenreiter could not let me use the new HHA edition of Lotario because they had arranged for its first performance to be at Halle. Since we’d already made plans to perform it, we have the new ‘Curtis’ edition which I guess is identical. I went very carefully over the autograph, and there are very few things that are not clear. This isn’t my first opera, and if you really look carefully at the autograph, and you know how Handel worked, and know how to interpret the autograph, there should probably be no places where the forthcoming HHA edition and my score vary. DV: Do you also look at the printed librettos and the conducting score? Of course, the conducting scores can tell a very different story to the autograph due to revisions made during performance runs or for revivals. AC: Oh yes. Though when there are changes I tend to prefer the autograph - so I usually start with that. Then if there’s something in the conducting score that clarifies the autograph I use it. But if it’s something that’s different, then I’ll evaluate it but usually go back to the original. Often the conducting score will incorporate something that some singer didn’t like or was changed because of some problem with the orchestra or something that didn’t work. Handel was maybe a little too easy in that sense. He knew what he wanted from the beginning and that usually is what we should do. DV: Your forthcoming recording of Radamisto is the first performance version from April 1720 rather than the more familiar second version Handel revised for an altered cast in December 1720. Do you choose a version to base your performance on, or are you flexible about the historical accuracy of the texts you perform? Do you mix and match versions? AC: I’m very rigid about philology when it comes to preparing the score. But when it comes to preparing a performance it’s not relevant in the same way. That’s not to say it’s irrelevant, but it’s relevant in a different way. I think when we publish a score with a text we should be very careful about every word, every note, etc. When we do a performance, it’s capturing the spirit that counts more. To be more specific about Radamisto, the first thing that led me to consider the earlier version was that Nicholas McGegan had made a fine recording here in Göttingen of the second version. So why compete with that? Instead we could do something different. The second reason was that while I was comparing the two performance versions I realised that some famous pieces like ‘Dolce bene di quest’alma’, and even the most famous aria ‘Ombra cara’, are preferable in their original key, in the original version. For instance, some of Handel’s transpositions require an octave drop to the melody that is really unfortunate and less satisfactory. DV: Does it disturb the rhetorical strength of the music? AC: Yeah, not to mention all the changes in the vocal line, and things like the fact that Handel didn’t even finish changing the viola part for the second version. There are some really awkward things you have to do in the transposed version, yet nobody knows the original. ‘Ombra cara’ is one of the most famous Handel arias that we have, but there is no recording of it in the proper key of F minor that I know of, and I’ve certainly never heard it in concert performed by a soprano. DV: What are the differences between the first and second versions of Radamisto? For instance, I know that the villain Tiridate was played by a tenor in April 1720. AC: That is another really strong reason for using the first version. For example, in the more familiar second version the first aria for the bass Tiridate is OK, but in my opinion it is one of the weak points. Whereas the first aria for the tenor incarnation of Tiridate is a transformation of Giuliano’s aria from Rodrigo, but with trumpet which Handel didn’t have in Italy, but which he did have in London. It is really fabulous. The next time I teach a Handel course I would use that aria, in our recording, to show what Handel did in these revisions. Many people get the idea – and I must say I had it too for many years – that Handel was so full of brilliant ideas when he was a young man in Italy, that when he got to England he sort of sat back in his comfortable chair, ate lots of food, and put forth his old arias and recycled them. But that is not at all the case: look at Tiridate’s first aria in the first version of Radamisto – it’s not recycled, it’s transfigured! It’s the apotheosis of the warlike aria, and it is just a magnificent piece for tenor. It was a good piece in Rodrigo, but Handel makes it sublime in Radamisto. DV: When you toured Radamisto around Europe in a concert version, didn’t the cast change slightly between the performances and the recording sessions? Is that how things normally work? DV: Was your tenor Tiridate originally supposed to be Kobie van Rensburg? AC: Yes, but he couldn’t do it, so we took the young American tenor Zack Stains. It was a risk because he’s inexperienced, although he sung for William Christie in Monteverdi’s Il Ritorno di Ulisse. He was good as Tiridate, and it is a very difficult role. We haven’t finished the editing yet on Radamisto, but it should come out very soon. DV: It’s not easy to find good Handel opera tenors. For example, the tenor on your recording of Arminio was a bit weak. Is it a problem to cast tenors in those roles? AC: Yes. In Arminio we had a very small budget, and also I wanted to stick with the principle of having as many Italians as possible. I still have that as a principle, but the reality means that usually if you have half Italians that is about as much as you can do. The forthcoming DHM (Deutche Harmonia Mundi) recording of Lotario will be strongly Italian, and I hope will feature good diction and good fast speaking recitatives. DV: How do you define a great Handelian singer? DV: Musically or on a personal level? AC: Musically. They can be very difficult to get along with, like Sandrine Piau, or even Simone Kermes. But if they sing that sublimely, I’ll take anything. We do have fights. Inevitably there will be conflicts between people of high temperament, but that doesn’t matter. What really matters is the music. How do I define what it is that I like? First of all, it’s not a so called early music singer which most people define as someone who doesn’t have an excess vibrato, who also, unfortunately, has no excesses of emotion due to the same sort of stereotype. Well, if you look at Italian Baroque painting, or sculpture or architecture or anything else, how can you say that there was no excess! Excess is part of the whole notion of baroque, and in any case Handel’s operas are extremely dramatic. They are not only open to situations of great conflict, but they have great extremes: they have to have that, they exist for that. If you deny that, you deny at least half the function of the opera. So my first definition of a good baroque singer is someone that is capable of doing extremes. What is even more difficult is finding someone who can control those extremes, somebody who can be extremely dramatic without wobbling all over the place so you can’t hear the pitch any more. You know the vices that we accept in later opera. Somebody like Callas was a great actress and some would say a great singer. I would not have, even if I could have, chosen Callas to sing a Handel heroine. I just don’t think she was capable of the kind of control that somebody like Simone Kermes has. Which is not to say that Simone Kermes is a greater singer than Maria Callas. They are both great singers and both great actresses, but I certainly prefer to work with Simone Kermes. DV: In the concert performance of Lotario yesterday, some of Simone Kermes’s cadenzas were really quite outrageous. AC: I push her to do that. I write the candenzas, although the result is usually not what I write! The result is collaboration. Somehow any given cadenza usually ends up being a little higher than what I wrote. But I think it was at the Handel Centenary celebrations in 1784 that somebody protested that a cadenza went too high. I think it was about a soprano who sang “Ah! mio cor” from Alcina as a concert aria in Westminster Abbey. The singer went up to high F, and I would agree that going up to high F in “Ah! mio Cor” is probably inappropriate whether it be in 1784 or today. But it does show that in the 18th century they also did it. It also shows the audience protested when it was really out of bounds. I think that most of the time Simone is within bounds in the sense that she does it in arias that are extravagant and are extremely emotional. For instance, I wrote some of the most radical things and encouraged Simone in the shipwreck simile aria from Lotario. In fact, that cadenza suggests that she nearly gets out of the quay but may not be able to get back. Then at the last minute she quickly returns and we go on. I hope that works. At least I hope it will by the time we do the recording. It’s a way to suggest a real shipwreck that is never the less in the 18th century style. DV: Is the spontaneity of performing cadenzas in concert different to producing a recording that has to stand up to the cold light of day? AC: Yes. To an extent I share Nikolaus Harnoncourt’s notion that a recording can’t have the sort of things that you do in the theatre because they would be so extravagant that they would become stale hearing them a second, or especially a third or fourth time. On the other hand, I wouldn’t go to the extent that he does of forbidding extravagant things because I think an extravagant thing can be so good that it does hold up over 8 to 10 hearings - and that should be enough! DV: Your last Handel opera recording Deidamia was the worthy winner of the 2004 International Handel Recording Prize, and has been highly acclaimed in the press. That must be gratifying recognition for Handel’s last and often dismissively treated opera. AC: I must say it is a surprise that Deidamia has won all these awards because I was afraid it might be an anticlimax because Arminio was so highly praised. Deidamia is also an unknown opera, and one could say it is a lighter piece, and I was a bit afraid that light music is not perceived as my speciality. If there are any people who think about my work, they probably think about me as somebody who brings out the dramatic, intense, sombre and dark side of Handel. But I love the light side! I appreciate his sense of humour as much as anybody. The irony of Deidamia was very strongly in my mind, and I guess it must have come across because people like it. DV: Since then you seem to have doubled your Handelian activity. You’re now planning recordings for Deutche Harmonia Mundi (DHM) as well as Virgin Veritas. It is very unusual for an artist to record for two different labels these days. Can you explain how that works? AC: We’ll actually be recording for three or four different companies! The reason it has to work is that no one company can afford to bring out more than one Handel opera a year, at least that’s what they tell me. Of course, nobody can record an opera of any sort these days without some help, so you have to find a sponsor. Some recording companies, in fact, if they find a sponsor, use it for chamber music because they consider it is not possible to make enough money on opera. You’re happy if you sell 5,000 copies, but with sales of 5,000 copies and a cost of several hundred thousand dollars, how can you expect to make money? So with a sponsor it is still feasible, but the cost of preparation, printing the booklet, and putting out 3 full CDs rather than 2, is always more complex. It is more difficult to produce than the normal single CD. So the companies can only do one a year. I’ve decided I can do more than one opera a year, and want to because I don’t want to go on doing this forever even if I live to be able to, but I think 2 operas per year, 3 at the most, is feasible for me. DV: So Radamisto is being released by Virgin Veritas in or around September, and Lotario will be released in August on DHM? AC: Yes, and then we are going to record Rodelinda for Deutsche Grammophon Archiv with Simone Kermes in the title role. Marijana Mijanovic is going to sing Bertarido, Sonia Prina will sing Eduige. Grimoaldo will be Steve Davislim, who is my favourite tenor at the moment. He will also record the role of Berengario in Lotario. My favourite bass at the moment is Vito Priante, and he will sing Garibaldo. Unolfo will be the fabulous Canadian mezzo Marie-Nicole Lemieux. We are doing that in September, so it might be out by the end of the year, or the beginning of next year. DV: Are you already thinking ahead of that? AC: I’m thinking of doing the original first draft of Sosarme. It was originally called Fernando and was set in Portugal. I personally like that more. It makes it closer to us. The Sosarme setting is legendary, ancient middle-eastern history. It is not living history to us, whereas an actual ruler in 13th century Portugal was fairly close to Handel, and I think can still be close to us. Maybe that’s a minor point. A more important point, in terms of Fernando being performed, is that it interested the Lisbon San Carlos Theatre to do the only Handel opera that has a Portuguese setting. It was set in 13th century Coimbra, which is the university town of Portugal. I doubt that there will be a performance there, and if there were, I doubt anybody except a few lively students would come because Coimbra has become rather a sleepy provincial town in spite of the university. But it will be of interest to people in Lisbon. When we perform it outside Portugal we will revert to Sosarme. DV: Is Tolomeo still part of your plans? AC: Yes – that’s near the top of my list. I’m very fond of that opera. DV: It must be a long list! There are almost 40 excellent operas, many of which deserve more recognition and better performances than they currently have on CD. Are you consciously trying to fill the gaps? AC: Yes, that is conscious. Like everyone else, I would be tempted to choose to perform another Ariodante and another Giulio Cesare rather than doing, say, Parnasso in Festa, but I feel it does a service to Handel and to music lovers everywhere to do pieces that are unknown. Once those are all done well then it might be time to do another Giulio Cesare! What’s on your list, by the way? AC: Yes, Ezio is near the top of mine too. AC: Partenope? I’d say that’s at the top of the list! Faramondo is also on my list. We have a duet from Faramondo on the new recording of Handel opera duets. DV: How did you select the programme for ‘Amor e gelosia’? AC: It started with my idea of doing Domenico Scarlatti’s ‘love letters’ with two singers last year. I’d heard it done with one singer, a student, and I thought it was fabulous music but why not do it with two singers and make it like a real dialogue? My first idea for the two singers was Patrizia Ciofi and David Daniels. It didn’t work out with Daniels – he was too busy of course. We ended with Anna Bonatatibus, who is marvellous. Then the next project was supposed to be Handel duets with the same two singers – a selection of little known duets from little known operas, with one or two famous duets added as well. I also got the idea of making it on a theme, which was originally to be called ‘Love and Hate’. But I decided that it isn’t really hate but jealousy, which is quite another thing. So we’ve called it ‘Amor e gelosia’, and it does make a point of choosing duets that are concerned with jealousy and reconciliation. DV: Can you choose a favourite duet? AC: “Io t’abbraccio” from Rodelinda is about as good as you can get. We’ll be doing that again with different singers of course, so it will be a challenge for me: I guess my interpretation will be very different. I was shocked the other day at hearing two performances of the same duet – one here in Göttingen and another elsewhere with different singers, but both performances directed by me. The tempi were different – everything was different! But I’m pleased about that, because it means that not only am I dependent upon the singer, but I am sensitive to what the singer is doing. I think one has to be both those things with Handel. DV: You don’t conduct English oratorio. AC: Because I live in Italy! It would be hard to find a chorus with acceptable English. But I hasten to add that I’d love to perform Il Parnasso in Festa. At the moment I go along with Anthony Hicks’s conviction that it was meant to be done with a chorus of only three singers on a part. With the sopranos and altos already in the cast, and a bass soloist, who all sing in the choruses, all it needs are three tenors and two basses. DV: Parnasso in Festa is totally unfamiliar to even the most ardent Handel nuts. AC: There is the prejudice I had, which I’m sure everyone else has too, that it is a rehash of Athalia. But Tony Hicks says that there are several pieces that are actually better in their new context in Parnasso in Festa, and I agree. DV: You don’t follow the current fashion for using countertenors in every role that can possibly have one. That appears to be a deliberate decision. What is your feeling on using countertenors in modern performances of baroque opera? AC: I’m sure I was the first to use four countertenors in one opera, way back in the late 1960s, when countertenors were totally unknown to the audience – so to have four of them in one opera must have been quite a shock. The number of countertenors on the stage generally has risen enormously, and the number of countertenors in my productions has fallen drastically. I’m very proud to say that Lotario will have three genuine female contralti, which is also a first – I have to say I’m even more proud of that than being the first conductor to use four countertenors. It is very important to find good true female contralti, and once we’ve done that, when you can’t fine one, then you can do what Handel did: if he didn’t have a good castrato or a good contralto, then he would use a falsettist, but only if he had to. At least that’s the impression I get if you look at the evidence. But I must say that a really good countertenor appeals to me. I’ll be working with three next year: Lawrence Zazzo, Christophe Dumaux, and Emmanuel Cencic. DV: So your policy is to always choose the right singer for the right role, regardless of gender. AC: Absolutely. But having said that, I’m increasingly working with Handel’s music, and with both countertenors and female contralti and mezzos. I’m convinced that there is a natural quality with the female voice. The castrati must have been closer to that natural quality. Take, for instance, somebody like Hilary Summers: people might say Hilary sounds like a countertenor, and some people say that about Sara Mingardo. Actually, I guess I did say that when I first heard Sara myself! But of course we say they sound like countertenors because we never hear a female contralto who can control her vibrato! But singers like Hilary, Sara, and Sonia Prina can also have a hard edge and can sound masculine. Its high time we noticed that and made use of it. Since castrati don’t seem to be an option at the moment, we have to realise that such a singer is closer to what Handel wanted than most countertenors. DV: Do you feel that each Handel opera you investigate, and come to know and love, teaches you something about Handel? AC: Absolutely, and if I put it all together, what it teaches me is that Handel and Mozart are the great geniuses capable of musical characterization. They put everyone else to shade, including - and I hate to say this - even Monteverdi. There is no opera greater than Poppea in my mind, and Monteverdi is perhaps the greatest musical dramatist, period. But what’s great about Monteverdi is complicated and has to do with the nature of music and language in a way that was not possible for Handel and Mozart because musical language had evolved. Mozart and Handel are just head and shoulders above everybody else. No one else comes close! DV: How would you describe the difference between Handel and Mozart? AC: Mozart’s operas have immediate characterization that instantly appeals and continues to appeal. Handel has some musical characterization that appeals immediately, but some that you don’t immediately understand. Of the two composers, I think Handel is more difficult to get to know. But after 20 or 30 years of struggling, I’ve come to see that there is enormous subtlety in what Handel does - even more so than Mozart!